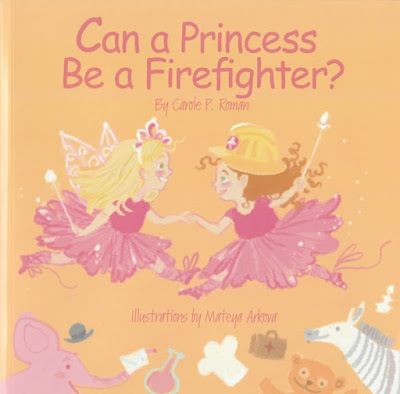 Margaret Reviews Books: Book Review | Carole P. Roman | Can A Princess Be A Firefighter? Book Review | Carole P. Roman | Can A Princess Be A Firefighter? I received this book for free from the author. This book was sent to me through Bostick Communications. Carole P. Roman sent me a copy of this book in exchange for an honest review after I posted reviews for other books by her. Synopsis: Two little girls pester their father with questions about whether or not they can be a professional and still be a princess. Motivated by her granddaughter's fascination with all things princess, Carole P. Roman penned this adorable poem celebrating all the wonderful possibilities waiting ahead for them.